﻿What can I say about Jen...........she is one of the most thoughtful and caring people I know. She remembers the little things......and that means the world to me. We have had LOTS of laughs over the years and she's truly been there for me like a good friend. I don't know what my life would be like without Jen in it. I am thankful for the MSN chats we have about everything. :) I am thankful for the times when we all get together for our Stamping Away weekends (which by the way, we are due for!). I am thankful for all the good eats. And I am especially thankful Jen for your friendship. And now I'm going to stop because I just might cry! 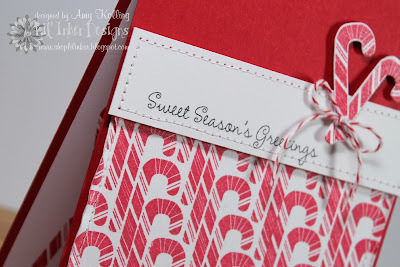 The Twinery/Market Street Stamps Blog Hop! Today is going to be a great day here on the 'ole blog. Today is the first day of The Twinery and Market Street Stamps Blog Hop!!! If you arrived here from Katrina's blog then you are in the right place. If not, you need to start back at The Twinery or Market Street Blog for details of the blog hop. 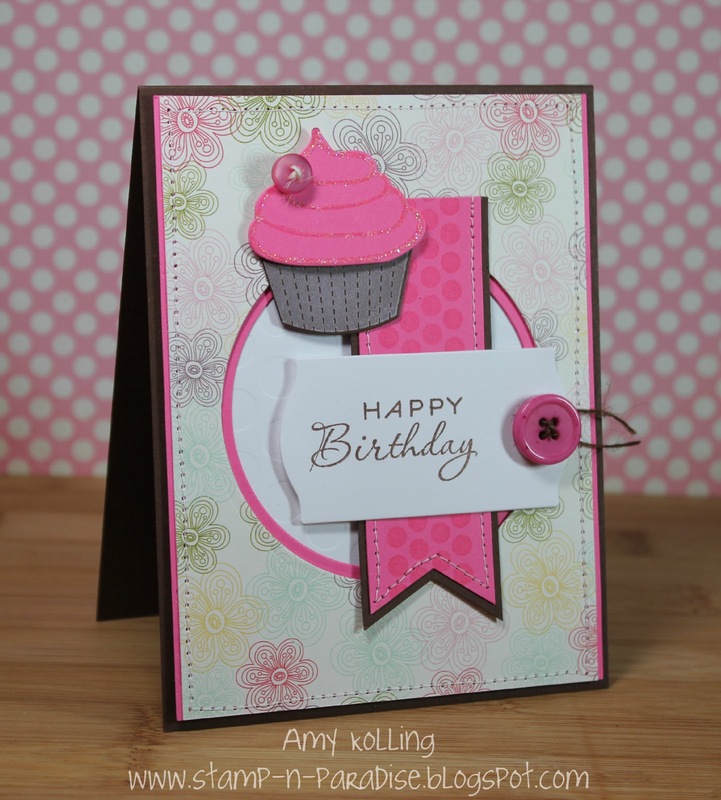 The first card I created was using the FABULOUS background stamp from Market Street Stamps: Sweet Lace. Just look at the details in this one background stamp! I am in love and this background will definitely get some major use in my cardmaking! My sentiment is from Comforting Florals. Here I've used some Blossom twine from The Twinery for a simple but effective wrap in place of the traditional bow. 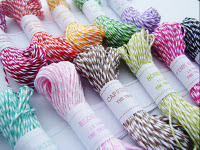 For my second card I went a little more bold and colorful to get in more yummy colors of this awesome twine. Here I've used the set: So Happy from MSS and created my own little floral flower bed. I stamped the flowers and embellished the centers with tiny twine bows in Maraschino, Pink Sorbet, and Lemondrop. I then wanted to point out my grass. I found it very easy to make my own grass out of the Honeydew twine when you place 1/8" Scor-tape down and then start forming your grass. For good measure, I placed a few horizontal strips over my grass again using Scor-tape. Would you like to know if there are prizes to be had? Well, you all are in luck. The Twinery is generiously giving away one Ultimate Sampler Pack ($25 value) and Market Street Stamps is giving away a $25 Shopping Spree! You must visit each blog, each day and leave a comment to be eligible for either prize. Deadline for the prize giveaway is Friday, November 25. Prize winners will be drawn at random and be announced on Saturday, November 26 on both The Twinery and Market Street Stamps blogs. Thank you so much for stopping by today and now your next stop is Linda. Hi there! Amy here with you via the Market Street blog! As I write this post to tell you how I enjoy the fall weather, it is a crazy 70 degrees here in Kansas. Beautiful beautiful weather! This is my type of weather too! All this aside, I thought I would share one last "FALL" card with you since we are now heading into the Holiday season. This card uses the wonderful Autumn Greetings set. I thought I would use this set one last time for a "fall" theme. I chose to go a different route with my card today.......CAS. Well, that is except for the colored little scarecrow. I wanted him front and center! I layered a couple of cardstock color panels down the side with one being stamped with the Pretty Perfect Grid background stamp and then stamped a simple sentiment and added a button! Have you checked out Autumn Greetings? 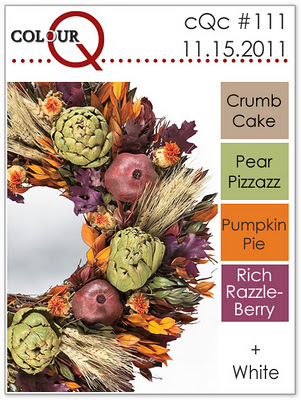 It isn't only for fall themed cards.......it has a fabulous floral image too. I'll be sure to show you more with that later! I haven't played along with the girls over at the ColourQ for a long time but when I sat down to make this card, I needed a little help with some colors and this week's color palette was perfect!! I do not own any Rich RazzleBerry so I improvised and colored using my Prismas and OMS and I did find a button in my stash that matched it pretty well (it's showing up dark here). Thanks so much for stopping by! All supplies PTI unless stated. Hi blog friends! I am enjoying some quiet time in my stamp room while the rest of the house is still sleeping.......shh.....Don't tell but we're skipping church today. :) I have a Cupcake card to share today that uses the Cupcake Collection from PTI. I am loving this set. I know, I know.....It's been out for a long time (and I've had it since it was released) but I've been wanting to get more use out of some of my older sets. What a better chance to use it than for a little girl's birthday! It's kinda hard to see since I covered it up with my focal point but the white cardstock circle is impressed using the Polka Dot IP from PTI. I think it gives such great texture to this card! Again I used the awesome paper from Echo Park Springtime collection. My layout came from the latest Mojo Monday sketch. Did you think my card looked familiar? Well, it's part of the ensemble I made that I posted yesterday for the Wee Memories challenge for birthdays and parties! Take a peek at everything together. 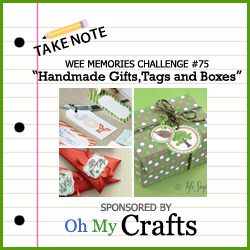 We're back for another edition of the Wee Memories Challenge! This week we're celebrating Birthdays and Parties. I thought it was about time to get some use out of my Cupcake Collection Dies from PTI. Pair these with the coordinating stamp set, you have a great match! 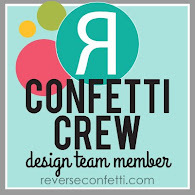 This week's fantastic sponsor is Nikki Sivils Scrapbooker and the winner of this challenge wins a Paper Prize Pack! Who could use more paper? :) We love seeing all your cards week after week, so keep them coming! All supplies PTI unless noted. Lil' Inker Designs: Release Day Blog Hop! Yay............Today is RELEASE DAY for Lil' Inker Designs! 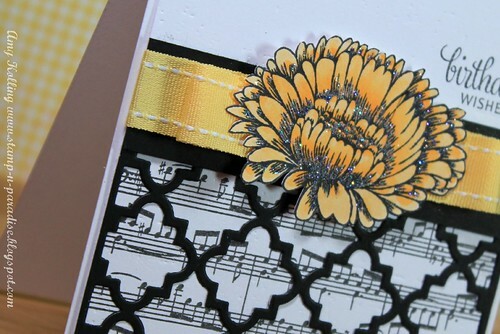 Have you enjoyed this week of projects using the newest Lil' Inker stamps and dies? We certainly hope so! If you are on this blog hop, you should have arrived from Sarah's blog. I have 2 cards to share with you today. My first card uses Holly Jolly in a traditional way using the holly leaves paired with this fabulous pattern paper from Authentique. I actually bought this paper for another project but I haven't started on that just yet. I'll be sure to show you pics when I do! I thought the sentiment was perfect to use with this pattern paper and fits perfectly on the strip wtih some die cut Holly Leaves and Berries! Just a close up photo of the tiny signature perforated details of the leaves and berries! Love! 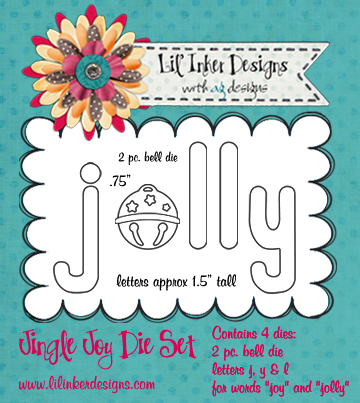 My second card uses the Jingle Joy set of dies.....specifically the bell. Boy, I tell you when Laura and Ariana look at details, they certainly get them right! The bell die even features a tiny band to layer over the main bell image......makes for even more dimension! Here I've die cut the bell 3 times with glitter paper in an aqua color. My color scheme came from this gorgeous snowflake paper by fancy pants design: Saint Nick collection. Now let's keep moving along on the blog hop to Teresa's blog and don't forget to leave comments as Laura is giving away 2 gift certificates to the Lil' Inker Store somewhere along the way! Have a great time! Welcome back to the Lil' Inker Designs Holiday Release! Are you enjoying the new products and all the awesome samples by my teammates on the design team? I know I've been wow'd by them! You should have arrived from Ariana's blog today so if you did, you are in the right place! Well, today we have another new set for you: Jingle Joy! I think this set has sooo many options! I decided to use the stamps to create my own "sweet" background paper. I started with cutting (yes I said cutting) my "j" stamp apart so I just had the "j" and no dot. I used this image then to stamp my own pattern paper! I love how it came out and I used some of that Smooch Spritz again to give it some shimmer! The hop continues now and I hope you will join me over at Teresa's blog. Don't forget that Laura is giving out some gift certificates to 2 lucky commenters to the Lil' Inker Store so the more you comment, the better your chances are! Friday is our group post day so stay tuned for more projects then using all of the new products! 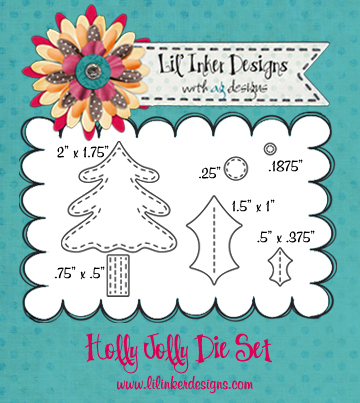 Lil' Inker Holiday Release Time: Holly Jolly! 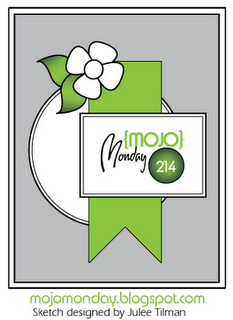 Today marks the first day of the week long release for Lil' Inker Designs. It's Holiday Time at Lil' Inker and you will see some great ideas using the newest products for the holidays. If you came by the way of Laura's blog, then you are in the right place. 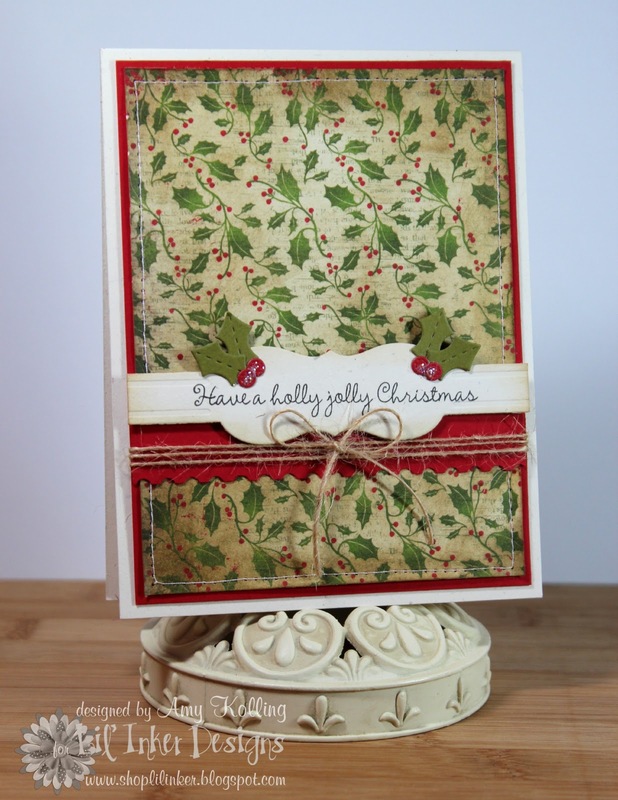 Today and tomorrow we are showing the set of stamps and dies called Holly Jolly. 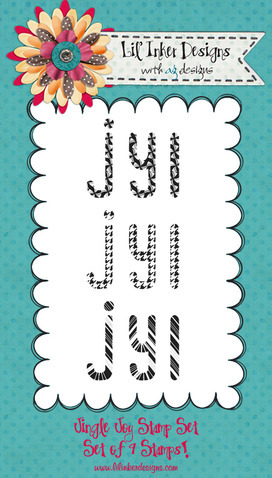 This set contains a bunch of great sentiments that have a traditional flair. Pair these with the new dies, and you have a match made in heaven especially with Laura's signature perforations she adds to her dies!! I chose to work with the tree die. The scene I created just reminds me of when we used to go find our own special Christmas tree every year. Sadly, we have an artificial one now but these are memories I won't forget! Now you may be wondering how I "stamped" my tree without having a stamp as there is not a tree included. I die cut a piece of fun foam and placed it on my clear block using double sided tape and simply inked it up. It works great and look at all the details you get.......all those little perforation marks show up!!! Here I stamped 3 trees on my ink distressed panel and then hand cut 2 others for added dimension. The trees in the background were stamped "off" one time and then stamped on my panel. Now, I wanted to share all the glittery goodness I added to this card and truly in person it just sparkles. Kinda hard to capture in a photo especially for me. The snow banks were hand cut and glittered using a glue pen and sprinkling Martha Stewart glitter on top. The extra shimmer was done when my panel was completely finished. I used a product called Smooch Spritz in Vanilla Shimmer. I sprayed a couple of times and let it dry. I also added some falling snow using a product called Enamel Accents. Love this stuff.....it dries fairly quickly and adds such a fun shiny opaque effect!!! Here are the product graphics for you to see the details in these sets. Now, I'd love to hear what you think! Laura will be giving out some prizes of gift certificates to the Lil' Inker Store at the end of the release. Your next stop on the blog hop is Ariana and she is going to share more about the creative process and what her role with Lil' Inker Designs is! Have a wonderful Monday! I'm also going to sneak this over to the Lily Pad Cards Simon Says Stamp Challenge for texture! Top 3 at Practical Scrappers! Yep you heard me right! I made the Top 3 at Practical Scrappers for their card contest! Now, there is no more voting........the rest is up to the Practical Scrappers Team to choose the winner! So I wanted to take this time and say THANK YOU for all the time you all put into voting each week for me. I wouldn't have made it this far if it weren't for all of my blog friends (and family). I am forever grateful! Onto my card for the last challenge they issued: Use your favorite manufacturer, favorite tool, and favorite technique. My card is quite different than my other submissions to the contest but I knew exactly what technique I wanted to do. One I love........Embossing and using Distress Inks. Have a great Sunday..........I have lots of crafty things to work on! 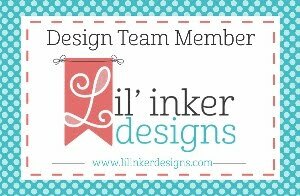 Stay tuned for the Lil' Inker Designs Release that starts tomorrow! Since this has LOTS of texture, I'm entering this into the Lily Pad Cards Simon Says Stamp TEXTURE Challenge! You should have arrived from the blog of our sweet guest designer this month: Angie Blom. Ever since the Front and Center Die came out from PTI, I've wanted to try this on my own before buying this expensive die. Well folks, I found out I don't need this die to make my own gift bags now! I started with a plain brown paper bag and trimmed it down to 5 1/2 ". Then I figured out how tall I wanted my bag "front" and "back", cut cardstock to size, and then used the EDGER DIES from PTI. Punching an oval for the handle finished it out. Simply glue, adhere, and embellish as desired! I LOVE LOVE the results and will be doing more of these for sure! Thanks so much for joining us today for the monthly Wee Memories Blog Hop! Our fabulous sponsor this week is Oh My Crafts and the winner gets a Paper Bundle prize pack! Your next stop on the blog hop is Anita......and I'm sure she will have something fabulous to show you! Have a GREAT Saturday! 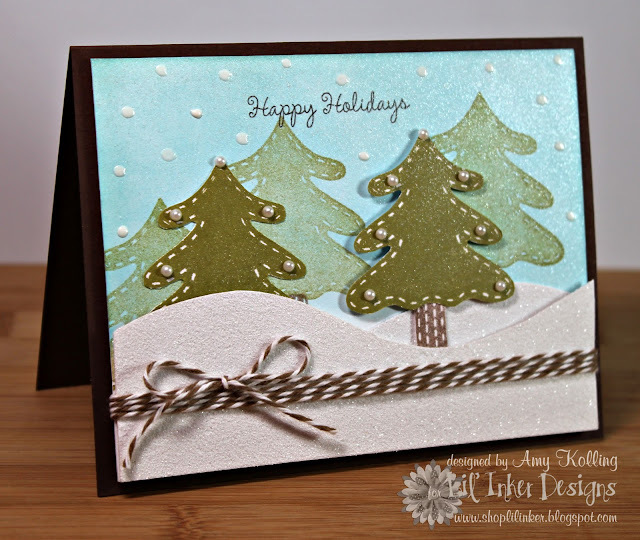 Today many designers are participating in a very special blog hop.........Cards that Care. This is a card drive to collect holiday cards for the elderly that live in nursing homes. This has been put together by Vera M. Yates and this year she has teamed up wtih Jennifer McGuire. If you arrived here from Melania's blog, then you are in the right spot! All of the card drive details can be found--- HERE. The holidays are about family, about kindness, and joy. The holidays are the times when many of the elderly who lives in nursing homes would really feel the loneliness or missing their family. Wouldn't it be awesome if we can bring a smile to their face & brighten their holiday season simply by sharing our love of card making? A simple gesture to let them know that they are not forgotten. We all love making cards and what’s better than knowing our creations can bring a smile to others? We hope that many of you will help and join us in our effort to spread joy & cheer. We already have some people that have agreed to help us deliver the cards to selected nursing homes. Here is my card using the new set from Wplus9 called Fair Isle Backgrounds. Wow! This set is super fun and I loved using it for a holiday card for this card drive! I've also used the new Pure Poppy ink from PTI.......it stamped beautifully the FIRST time. My card was inspired by my blog friend, Jinny Newlin. She used this set so beautifully during the Wplus9 release. I also made this for the Simon Says Stamp challenge to use buttons! 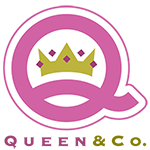 Here are the generous sponsors of the blog hop: Lawn Fawn, Penny Black, Sweet Stamp Shop, Avocado Arts, and I Love it All! Winners of prizes will be randomly chosen from comments on participants blogs so the more blogs you comment on, the better your chances! You have the whole weekend to leave your comments (til Sunday, 11/6/11 midnight CST). Your next stop on the blog hop is the sweet Cathy Fong. I am a mom and wife and when I'm not hanging out with my family, I work full time as a dialysis nurse. I love papercrafting and making cards! Thanks for stopping by to see my work! Paint the Town with Market Street Stamps!